Write your obsessions. People say this all the time. Some go as far as saying that some writers write the same story over and over again in an attempt to get it right, whether it is about their mothers, their obsession with grammar, or like the book/movie Atonement, out of a need to make something right. My friend, the very funny, very talented Daniel Darling, used his obsessions to write his novel, but he also used his fears. The novel-in-progress, Blood Heist, is a story about a trio of friends who decide to rob a blood bank. It’s a work of genius, funny, gripping, cinematic, and features two of Dan’s worst fears: blood and spiders. 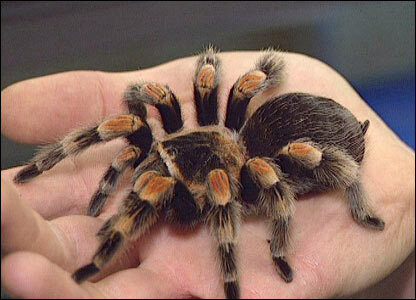 While writing the book, Dan actually kept a picture of a tarantula (or was it a brown recluse?) on his desk top so he could stare at it as he worked. He often grew nauseous when he wrote the scenes about blood (and there were several). Gotta love Dan for that. I don’t know if he did this out of advice or if he did it out of instinct, but my dissertation director is always telling me to give my characters my obsessions. She often tells me to let them grapple with the things I am trying to grapple with. Usually–for me at least–that also involves things that I am afraid of. But my fears tend to be things like working ones self into the ground. Or worrying about what it takes to make relationship (friendships and otherwise) last. Today, writers, try tapping into your fears. Maybe take fifteen minutes to free write about the things you are afraid of. Perhaps make a list. Or maybe by the time you’ve gotten to the end of this post, you are already thinking of one. Either way, see what happens when use your fears in your work today (the concrete ones–spiders, blood, etc–or the abstract).